‘It seemed the natural thing to do to grow organic,’ Mrs Porter said. 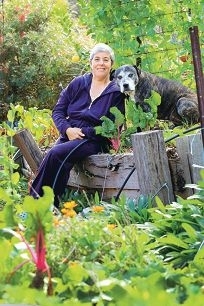 ‘Organic gardening is also a community builder. The group also manages a seed library from plants that thrive in the local area. Mrs Porter said anyone could have a go at growing fruit and vegetables. She urged new growers to start small and build up their confidence with herbs or sprouts, and only choose fruit and vegetable varieties they liked to eat. ‘It’s all about feeding the soil,’ she said. For Mrs Porter, there is no excuse and organic gardening is part of her greater philosophy of living lighter on the earth. Cuttings are recomposted or mulched, she uses recycled materials wherever possible and even has a solar oven in her front yard.